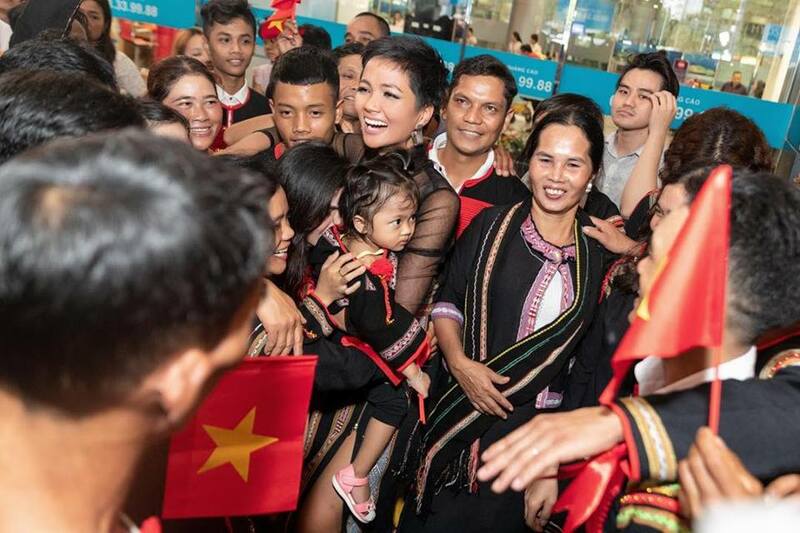 Miss Universe Vietnam 2018 H’Hen Nie is already home in Vietnam. She brought home 1 billion Vietnamese đồng ($43,000) in prize money, all of which she donated for community activities. This is the second time Nie donated her beauty pageant prize money to her community. On December 19, 2018, Miss Universe Vietnam took to Instagram to share the news. Nie was born in the Sứt M’đưng village in Cư Suê, Cư M’gar, Đắk Lắk, Tây Nguyên, Vietnam on May 15, 1992. Her family belongs to the Austronesian ethnic group called Ê Đê. The third out of six children, Nie helped her family in their coffee farm when she was young. Ladies in the Ê Đê community traditionally get married young so when she was 14 years old, she was asked by her parents to look for a husband but she refused because she wanted to follow her dreams in the city. After spending one year at the Nha Trang National Ethnic Community College in Nha Trang, Khánh Hòa, Vietnam, Nie transferred to the College of Foreign Economic Relations in Ho Chi Minh City, Vietnam to study Business Finance. To pay for college, she worked as a nanny, a maid, a tutor, a leaflet deliverer, a waitress and a Christmas tree decorator. While doing internship at a bank, Nie started modelling and was disovered by Vietnamese designer Đỗ Mạnh Cường in 2014 shortly after her college graduation. In 2015, Nie competed in “Vietnam’s Next Top Model” Season 6 and finished ninth. In 2017, Nie represented Đắk Lắk in the third edition of Miss Universe Vietnam. Besting 43 other finalists, she became the first woman from an ethnic minority to hold the title. The Ê Đê model and beauty queen donated 100 percent of her Miss Universe Vietnam 2017 prize money worth $10,000 to the schools she previously attended. This provided scholarships to underprivileged students. Advocate for education, women empowerment and HIV/AIDS awareness, Nie is a global ambassador of Room to Read, a nonproft organization based in San Francisco, California, United States. She is raising funds to build a new library in Lâm Đồng, Tây Nguyên and provide scholarships to girls in Asia and Africa.